Ilia Heit studied Pre- and Protohistory, Geology and Slavic Studies at the Johannes Gutenberg Universität Mainz. In 2013 he received his master degree with a study on “Die neolithische Muschelperlenwerkstatt von Fundstelle MPS 4 (Mil Plain Survey, Aserbaidschan): Archäologische und technologische Untersuchungen”. 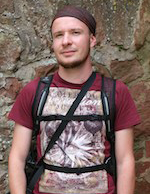 Since October 2014 Ilia Heit has been doctoral fellow in research project (A-2-2) Mobile village cultures in the foothills of the Kopet Dag and has participated in the PhD program “Landscape Archaeology and Architecture” (LAA) at the Berlin Graduate School of Ancient Studies (BerGSAS). His research focuses on prehistoric settlement activities in South Turkmenistan.